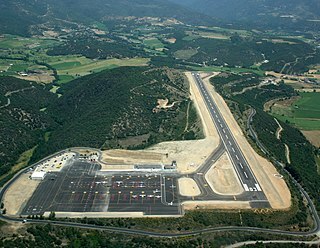 "El Gran Carlemany" is the national anthem of the Principality of Andorra. Enric Marfany Bons composed the music, while the lyrics were authored by Joan Benlloch i Vivó, written in a first-person narrative. 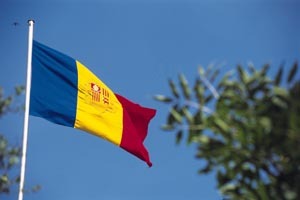 It was adopted as the national anthem on September 8, 1921, which is also the national day of Andorra. The lyrics make reference to several key aspects of Andorran culture and history, such as the heritage of the Carolingian Empire. The national flag of the Principality of Andorra was adopted in 1866. 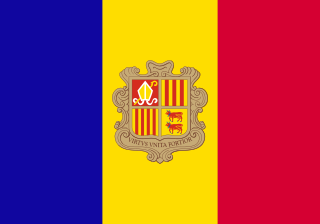 The flag is a vertical tricolour of blue, yellow, and red with the coat of arms of Andorra in the center. Although the three vertical bars may at first appear to be of equal width, the centre yellow bar is slightly wider than the other two so that the ratio of bar widths is 8:9:8. The overall flag ratio is 7:10. Roger-Bernard III was the Count of Foix from 1265 to his death. He was the son of Roger IV of Foix and Brunissende of Cardona. He entered into conflicts with both Philip III of France and Peter III of Aragon, who held him in captivity for a time. He was nevertheless a distinguished poet and troubadour.